The Women's March on Washington was peaceful, positive and uplifting | Jon Katz, P.C. Today’s Women’s March on Washington was a peaceful, positive and uplifting experience. What a counterpoint to yesterday’s many Trump opponents who sadly went beyond merely peaceful demonstrating. 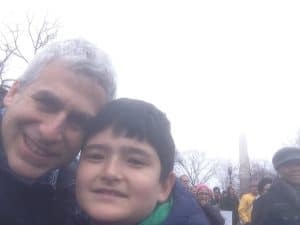 With hundreds of thousands of people positively mobilized today in the nation’s capital and throughout the United States — and even around the world from Antarctica to Cape Town — those dissenting from Trump’s itinerary (for starters) to register Muslims living lawfully in the United States, to make the nation less welcoming to those fleeing political persecution and economic misery abroad, to build a wall with the Mexican border, and to nominate conservative Federalist Society-recommended Supreme Court justices (let alone lower federal court judges) are in good shape to mobilize to influence their Congressmembers, to make headway in the 2018 election for all House members and those running for the Senate, and to make Donald Trump a one-term president. My son and I arrived past the White House a little after the 1:00 p.m. march starting time — missing the earlier morning speakers (I particularly regret having missed Gloria Steinem) — to find the march already wending its way down Constitution Avenue, where we joined the marchers at 16th Street, continuing to the Lincoln Memorial and to its south. Apparently initial plans for the march to continue to the White House were nixed due to the huge crowd of marchers estimated in the hundreds of thousands. We opted to drive into Washington, D.C., today from Virginia, because of the reports of packed subway cars and clogged subway station parking lots. We parked a few blocks from my law school alma mater, George Washington Law School at 20th & H Streets, and walked from there initially towards the assembly point near the Capitol building over twenty blocks away, until we joined the march at a closer point. With few exceptions, the mood was very positive among the thousands of people around us on the way to the march, during the march, and on the post-march streets clogged by cheering and chanting marchers as we drove back into and out of the city (having hoped to visit the Space Museum) and walked around when the streets were too clogged to do anything but park. We saw barely anyone identifying themselves as Trump supporters, not even in the vicinity nor in front of the Trump hotel that is five blocks from the White House. Aside from the more fortified than usual White House surroundings and more fortified Trump hotel itself, today a visitor in Washington would not have recognized much to say that Donald Trump had even moved into the White House. This march provided a great example for the future for demonstrators and police to interact well together. I saw no confrontations with police, no yelling, and no tension from either demonstrators nor police. The positive vibes from the marchers were emanating widely. When one motorcycle police officer passed by, some demonstrators gave him the thumbs up, and he returned the thumbs up. After the march, as dozens of marchers approached the FBI building, a uniformed FBI officer kindly asked everyone to wait as a car left the parking garage there, making small talk as the car approached. Even as marchers after the march often spilled into the street where cars were driving and disregarded don’t walk signals — which added to my own challenge taking a big circle to return to Virginia, away from all the closed roads near the march route — the police did not create any tension. Jimmy Carter’s input, before today, on Donald Trump is uplifting. He has confirmed that none of his family members voted for Trump, but already recognizes that Trump can be approached with specific ways to improve the world, including Carter’s underlining to Trump that Carter’s organization already has been doing work in and has offices in the Middle East to help smooth the Trump administration’s path in that part of the world. Even our most stalwart opponents can warm up more to our persuasion efforts by our offering to help them than to throw a proverbial water balloon at them. These next four years are an opportunity to take back our nation towards a path to true justice, liberty, and decency, and not a time to curse the reality that Trump is the nation’s president. Thank you deeply to those who organized and attended today’s nationwide and worldwide women’s marches.